Dalip Singh Rana (born August 27 1972) is an Indian professional wrestler, actor and powerlifter. He is better known by his ring name The Great Khali. He worked for the WWE from 2006 to 2014. Before he started his professional sports career, he was an officer in the Punjab state police. Under the ring name "Giant Singh", Dalip Singh became a pro wrestler for All Pro Wrestling in the United States. He made his first appearance in October 2000. On May 28, 2001, Brian Ong died while training with Singh. Ong had already suffered one concussion but was told to continue training. A second concussion was deadly for him. Because Singh caused his death, Ong's family brought a lawsuit against All Pro Wrestling. APW was made to pay the Ong family over $1.3 million. On January 2, 2006, Singh started working for WWE. He was assigned to Deep South Wrestling for training. Singh first appeared on WWE television on April 7, 2006. He attacked The Undertaker during his match with Mark Henry. Khali had his first WWE match on April 21, 2006 against Funaki. In July of 2006, Khali was removed from a match against the Undertaker because of elevated liver enzymes. On August 4, 2006, he returned to SmackDown. 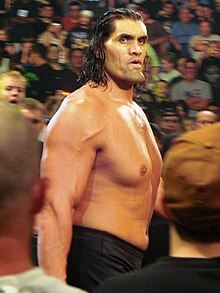 On August 29, 2006, it was reported that Khali would be out of action for several months due to surgery on both knees. In 2007, Singh was feuding with Batista in July before The Great American Bash. The two were scheduled for a match on PPV on Sunday, July 22, 2007. However, Edge had to give up the World Heavyweight Championship because of a pectoral injury. Khali had won the championship in a 20-man battle royal at the July 17 taping of SmackDown! He then went on to defend his title successfully against Kane and Batista at the Great American Bash. In 2005, Singh starred in the movie The Longest Yard as Turley, one of the prison's inmates. On March 16 2007, Singh starred in the 2007 remake of Get Smart, a movie based on the 1960s classic TV show, alongside The Rock. ↑ 2.0 2.1 "WWE "The Great Khali"". WWE.com. Retrieved 6 February 2012. : Note: WWE.com lists his height as 7'1" in the box and 7'3" in the prose. This page was last changed on 26 January 2019, at 23:16.